You might have to travel through the looking glass to find the Mad Hatter, but in the late nineteenth century, you’d only have to travel to Biloxi, Mississippi to find the self-titled “Mad Potter.” Just don’t try to use one of ceramicist George E. Ohr’s bowls, like the one seen here, at your un-birthday party. Ohr’s pottery is not symmetrical like traditional wheel-thrown ceramic pieces; the papery-thin walls of this bowl, for instance, twist and writhe, challenging the functionality that the bowl itself implies. Unfortunately, the reception in Ohr’s time to this bowl and the rest of the oeuvre was chilly. 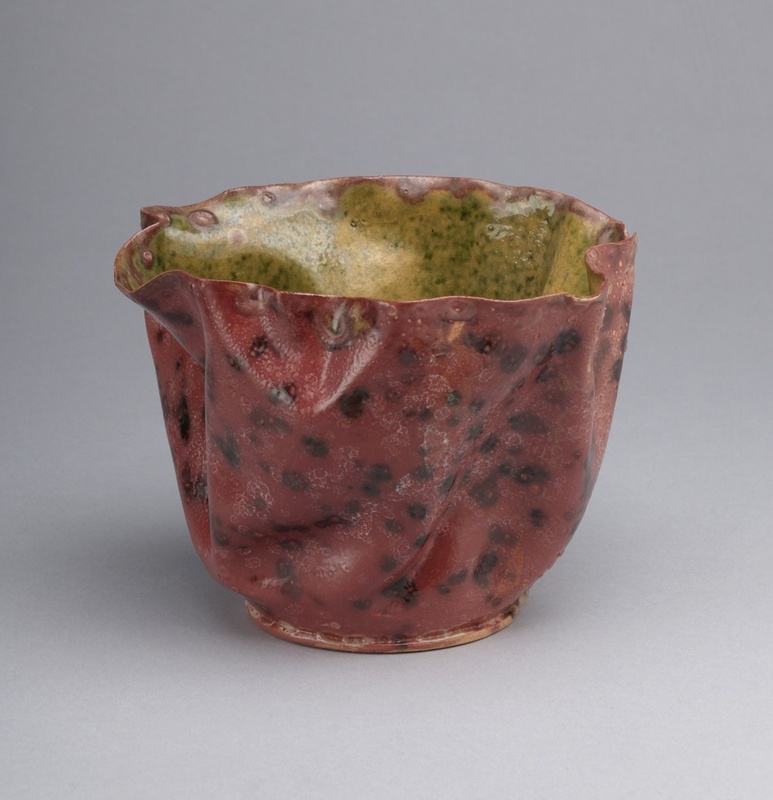 The free-form swivels and folds of this bowl and the loud, unabashed glazes are hallmarks of Ohr’s pots, but they also made his pieces very different from traditional ceramic work. This glazed earthenware plate from 1878-85 is an example of a contemporary foil to Ohr’s work. After his entire body of work was unearthed from an auto body garage in 1968, Ohr’s pots made a comeback. His pieces have been collected by the likes of Jasper Johns, Andy Warhol, and Steven Spielberg, as well as museums across the country. Because every piece strongly conveys the presence of the artist’s hand in shaping and decorating such original pots, the celebrity of the objects has led to the long-awaited recognition of the artist’s genius. Ohr’s time has come. [i] Paul Jeromack, “Ohr-tifacts,” Art & Auction (December 1987): 42. [ii] Garth Clark, “George E. Ohr,” The Magazine Antiques (September 1985): 495. [iii] William King, “Palissy of Biloxi,” Buffalo Express, 12 March 1899: 28. [iv] Bruce Watson, “The Mad Potter of Biloxi,” Smithsonian Magazine, February 2004, http://www.smithsonianmag.com/arts-culture/the-mad-potter-of-biloxi-106065115/?no-ist.